Getting a new mattress can be a great event, and in more ways than one – the lovely comfort of a new mattress is also big help in cleanliness. How do you say “ewwww” long and loud enough to to fully fathom the grossness of ten million dust mites feasting on bucketloads your dead skin and then pooping it back out in your bed? So when you think of popping your old deluxe mattress on ebay for 99c and seeing if there are any takers – the likely outcome is no bids. 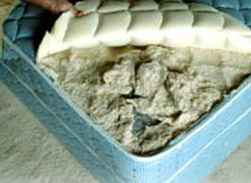 Mattress Removal – how do I get rid of this thing? A used single, double or king mattress or ensemble takes up masses of space and can be surprisingly heavy (especially as it ages) and awkward to move through the house. Putting it out for council pickup inevitably means it rains on it, making even more unappealing or a young family of rats make it their dream home while it makes your house look like a dump and kills a big rectangle of lawn. The best answer is to call in the professionals. When you call 1300rubbish they can give you a firm quote to remove and dispose of your old matress/es and beds and any other space killing junk you would like to get rid of. Just leave it where its sitting – they will come pick it up where it lies and carry it out for you, and any other junk you have. If there is mess or dust under the junk they have removed they will even sweep up afterwards. If you have an old mattress or mattresses to get rid of make the call today – there is no time like the present to get it out of there and gain your living space back.